To keep your hermit crabs healthy and happy their environment should be kept in optimum temperature and humidity levels. If you are not able to keep the environment stable then your crabs will weaken and become stressed which will lead to death. Hermit crabs are ectothermic creatures and must have a warmish and cooler side to their substrate. If your temperature falls below 75F on a frequent basis you need a reliable and safe method for heating your crabitat. Whatever type of under tank heater or other heating method you use, it is STRONGLY recommended that you buy a temperature control device such as a thermostat or rheostat. See some examples at the bottom of this page. Note: Heat rocks are not considered safe for hermit crabs! Here are some examples of suitable products you can use to heat your crabitat. A heat pad is the ideal solution for properly heating your crabitat. They provide even, consistent heat round the clock and can be paired with a thermostat to maintain exact temperatures.There are many types of under-tank heaters used with reptiles but you need to make sure your crabs do not overheat. For this reason we do not mount the heat pad under the tank despite it’s name. Heat pads are sold in a variety of sizes based on your tank size but those guidelines are often misleading. The heat pad should cover approximately 3/4 of the tank’s longest wall and should be mounted on the exterior side of the glass above the substrate line. The heat pad should keep the temperature stable between 75 (cool side) and 85 degrees (warmer side). Hermit crabs are cold blooded creatures and must have a warmish and cooler side to their substrate. To accomplish this you can place the heat pad all the way to either end or your tank. Your heat pad may need an exterior layer of insulation to help direct all the heat into the tank. Your local weather and home temperature will affect the efficiency of the heat pad so tweaks may be needed between seasons. In some circumstances it may be necessary to use a heat pad the covers the entire back wall. In this circumstance, the front wall of the tank becomes your cool zone. See the bottom of this article for a link to insulating products. UTHs can be used on plastic tanks however, plastic tanks are not recommended for use as permanent crabitat!! We strongly recommend you use a heat pad coupled with an overhead light to maintain the needed 12 hour day/night cycle. 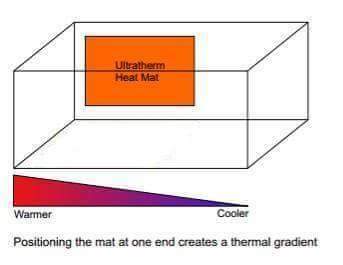 Heat Strips are manufactured in the same way as mats. They are made narrower and are generally used to heat small boxes and the cages used for housing juvenile snakes and some other species. The principles of use are the same as those for mats and the same precautions should be exercised. In small enclosures the heat build up can be very quick. The temperature should be adequately monitored and controlled with a thermostat. Heat pad or mats are available in multiple sizes. The type sold at most pet stores typically more expensive and the adhesive does not last very long. The Ultratherm heatpads are a very nice quality at a lower price. These can easily be mounted with tape and additional insulation can be added if needed. We do not recommend heating exclusively with overhead lights. It is challenging to maintain the proper environment with lights only. Plan for a heat pad and later adding an overhead light bulb. Use of a UVB bulb may extend the life of your hermit crab in captivity. The typical use is a 5.0 reptile bulb for most tanks. The bulb should be mounted inside, near the top of the tank with no glass or plastic barrier between the bulb and the hermit crabs. LED, Incandescent and fluorescent are acceptable as well. I you have a very tall tank or a vertical tank you may need a 10.0 bulb. These come in a variety of styles. It’s recommended to get a UVB sensor or meter that can measure the bulb output. Species such as C. perlatus (Strawberry) spend more time on the beach and may benefit from more UVB exposure than a forest dwelling species. UVB bulbs also have an expiration date. Research the bulb and find out how often it needs to be replaced and then record the day it was installed. If you are in a region where heat pads are not available you can use an overhead light or heat emitter. Now let’s looks at light fixtures you can use. You will need to switch bulbs from day to moon glo or purchase two lamps (unless you are using a heat pad at night). These fixtures will also hold a ceramic heat emitter. This low profile hood comes in several sizes and can be mounted inside your tank. These links also include the bulb! Pack your reptile’s daytime and nighttime heating all under one hood with this handy light fixture. Reptile terrarium heating and lighting has never been easier. The Bi-Light 2 Reptile Hood Lighting Fixture features two single high-heat ceramic sockets on separate switches and separate power cords and accommodates two incandescent bulbs or one UVB bulb and one incandescent bulb. Note: These are more difficult to find now. A combination fluorescent and incandescent light fixture designed to maximize the benefits of both types of lamps. This allows for the use of a UVB-emitting lamp along with incandescent full-spectrum daylight/heat lamps and/or incandescent nocturnal/heat lamps. The fixture contains special heat-resistant ceramic sockets for the incandescent lamps and is designed to direct light and heat down into the terrarium. With the combo-light, hobbyists can create an ideal lighting environment for their terrariums. *Ceramic heat emitters are challenging to use as they burn off humidity. Not suggested for beginners. Ceramic heat emitter can be used a stand alone heat source or in conjunction with other heat methods. No light is emitted. A 50 watt emitter is good for most crabitats. X-Large crabitats may need the 100 watt. Your emitter should be mounted at the top of your crabitat. This is an easy way to maintain a range of temperatures in the crabitat. Should I use a Rheostat (dimmer) or a Thermostat? The wattage and type of bulb you need will vary by fixture and by the size of your crabitat. Day bulbs and night bulbs are needed to maintain a natural light cycle which is vital to successful molting. The easiest way to control the needed cycle is with one of these handy timer powerstrips. Next Post: Should I bathe my hermit crab?